A new firm plans to market 3-D printers that might one day be capable of fabricating entire organs. Organ printing seemed like a crazy sci-fi pipe dream when researchers first started tinkering with it a couple years back. But it’s set to make the leap into real-world use in just a few years. As Information Week reports, Organovo, a company based in San Diego, is working on one of the world’s first commercial 3-D organ printers. 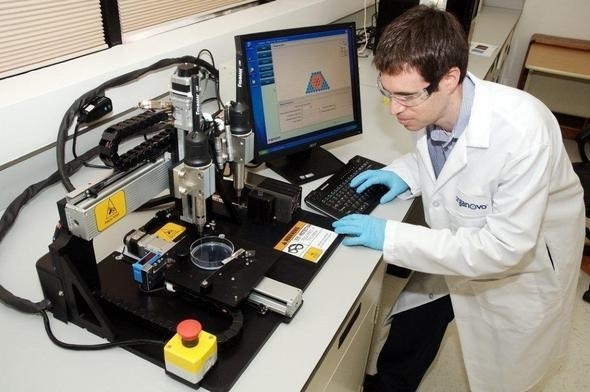 Organovo expects the first production models to ship this year to biomedical researchers. Up until now, Organovo has been angel funded, but soon, they’ll be raising VC funds for an expansion. paint by numbers,” he said. The printed material actually comes from two ink-jet cartridges. One is filled with cells. Another is filled with a hydrogel, which acts as a scaffold. The hydrogel is printed first, and the cells onto the structure; in 24-48 hours, they fuse around it to form a usable organ. For now, Organovo will only be able to print out blood vessels. But eventually, the hope is to use increased precision and modeling to create more complicated arterial branches–and one day, full-on kidneys and hearts. The ultimate promise is to provide a much-needed alternative to organ transplants, which suffer from a lack of donors. But printed organs won’t be in humans just yet: Right now, these machines are directed towards researchers. Human trials of the resulting tissues are at least three years away. For more, check out Information Week.